Do I Need To Sand Off Chipping Paint? Joy wrote me ~ I am going to start my first piece with Chalk Paint® Decorative Paint by Annie Sloan which has been painted with an olive green paint. The paint is somewhat peeling on places. Should I sand the paint off or is OK to just paint over it? Thanks for your help. 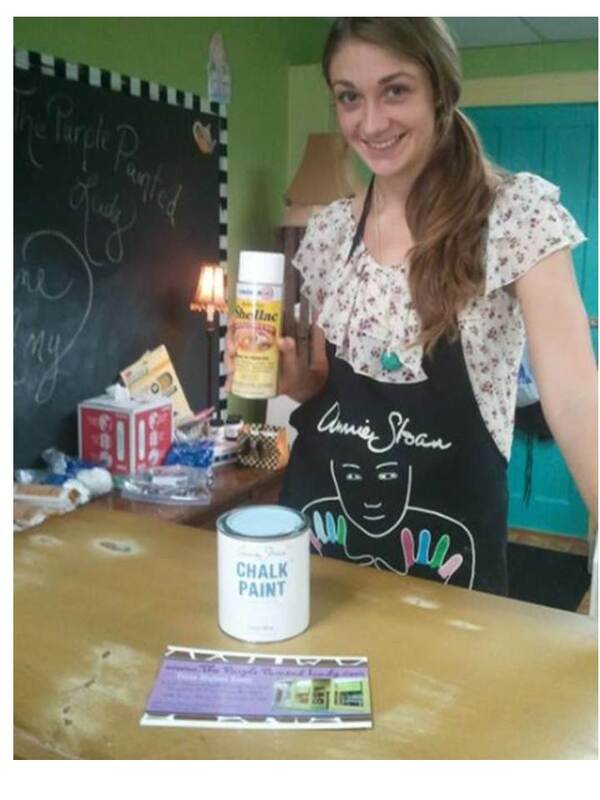 My response was~ You never need to sand for Chalk Paint™ to adhere- HOWEVER, if you have loose paint- you should sand to remove what is easily flaking off. (I often use the analogy that you never would want to build a house on quick sand) Chalk Paint® is incredible- but it is not a miracle. SO a solid foundation…or surface for this matter is important. That means dusting/cleaning your piece prior to painting (unless you want it to have extra texture), removing the rust or making it inert (unless you want the rust to bleed through) and removing loose chipped – peeling paint. And having texture or rust bleed through is not a bad thing at all- if you are going for that type of look! However, if you do scuff up and sand chipping paint to remove it- afterward – make sure that the surface is smooth. Meaning not pitted (like a hole) from where the paint chipped off otherwise your new top coat of paint color will take on the profile of the piece and if it is pitted or has pockets where paint has peeled- that topography will show through the fresh paint. Again- Chalk Paint® is amazing- and sometimes you can apply it a little thicker to compensate for variations in the surface- but keep in mind- if you apply very thick you run the risk of it “Crackling” a bit during the drying process. Another thing I would like to share – is that you may also want to shellac the whole surface once done spot sanding. IN FACT…9 times out of 10 – you probably should shellac after doing a partial sanding like shown in the image below of Adrienne who works at the shop with me. We sanded the top of the dresser that had deep scratches and since both stained wood and bare wood were exposed – we used the shellac to create a barrier so that the paint went on without shadowing from the different surfaces shown. NOTE that when using shellac…it is important to shellac the whole surface and not just spot treat. Shellac is also important to use when you have used wood filler…shellac after the wood filler is dry to allow the paint to be applied without any variation from the different surfaces. Wood filler will take the paint differently then your finished piece will and you do not want to have to apply extra coats to cover any visual differences. Again, my response is to never spot treat with shellac. Always do the whole side of whatever you are spraying as so you do not run the risk of either a surface line from just where the shellac perimeter is…or risk having discoloration due to just applying it in a small spot. Better to be safe than sorry. SO- as for the example in my photo- we would spray the whole top …but were careful when doing so not to over spray any other area of the dresser that we did not need to spray, meaning the sides or front. Again, since we only sanded the top, we did not spray the sides or front since it not necessary. Keep it simple and don’t make extra work for yourself- or use product that is not necessary since both equate to wasted time and wasted money. When I sprayed the top using the Zinsser Shellac can, I aimed the can from the center of the dresser top facing out to the sides as so to not get spray on the sides or front of the dresser. Does that make sense? (I probably should take a photo of me doing this- so you can see an image!!!!) And remember when working with spray shellac to always read the safety instructions on how to properly use any product. This entry was posted in How To by Tricia. Bookmark the permalink.